Disney Girl: My Favorite Time! Wordless Wednesday! My Favorite Time! Wordless Wednesday! I remember it like it was yesterday when this was the entertainment at the Golden Horseshoe. Betty Taylor's character, Slue Foot Sue, wore a beautiful long black velvet dress. She would always look around for a bald man in the audience to cozy up to and make jokes with. My dad, being somewhat balding, was always a bit nervous that it just might be his turn to be part of the act. This was always such a great show! I found this great article online about the Golden Horseshoe. The photo of Slue Foot Sue is exactly how I remember her. She is looking for her bald man in this picture. Here is the link JHM (Golden Horseshoe). A BIG thanks to Deb at Focused On The Magic for hosting such a fun hop and allowing all of us Disney fans to relive our memories and share them with each other every week! I just love seeing all of the pictures that everyone shares. I hope that you are having a fabulous week! Soon I will be heading off to the Happiest Place On Earth and eating a cookie (or two) while I am there! I will have some great pics for next week's Wordless Wednesday! Have a magical day everyone and thanks so much for stopping by! 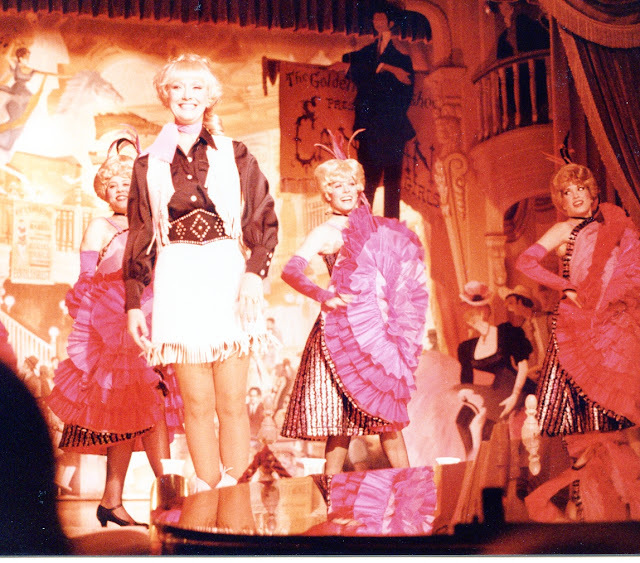 Great shot of the skirts from Golden Horseshoe! I love how you captured all the ruffles! Great photos! Love the matching shirts in the first photos. My boys had similar ones with another character on them. Great pics and great E's. Pure joy shining through. Oh I almost did the Tiki room as well! Great E's! Wow, it's been a long time since Slue Foot Sue! We were reminiscing the other week while we were there at Dland. The Tiki photo is beautiful and GH shot is priceless!! Looks like so much fun! TFS!!! What fun. I know that you and your daughter are enjoying your weekend at Disney. oh such fun! Hope you enjoyed a FEW cookies! Great pics!